our excellent selection below, and remember: Keep calm and stay shiny! Firefly is an American science-fiction television series created by writer/director Joss Whedon, creator of Buffy the Vampire Slayer and Angel, that premiered in 2002. Its naturalistic future setting, modeled after traditional western movie motifs, presents an atypical backdrop for the sci-fi narrative. 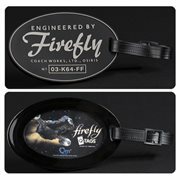 T-shirts, artwork, graphic novels, statues, and prop replicas derived from Serenity and Firefly will be enthusiastically received by any Browncoats you know... and that includes you. Fill your needs from our excellent selection below, and remember: Keep calm and stay shiny! Serenity is a 2005 science-fiction space-western epic film written and directed by Joss Whedon. It follows on from the canceled Fox sci-fi TV series Firefly, taking place about 2 months after the events of the final episode. Set 510 years in the future, Serenity is the story of the captain and crew of a transport and cargo ship. The captain and first mate are veterans of the Unification War, having fought on the losing side. Their lives of petty crime are interrupted by a psychic passenger who harbors a dangerous secret. This article uses material from the Wikipedia article "Firefly (TV series)" and is licensed under the GNU Free Documentation License. This article also uses material from the Wikipedia article "Serenity (film)" and is licensed under the GNU Free Documentation License.